Chelsea forward Eden Hazard could sign a new contract within a month and develop into "one of the greatest players of his generation", according to manager Jose Mourinho. The 23-year-old Belgium international, who joined from Lille in 2012, has three years left on his current deal. "It's a question of time - one more month - but we will end up with a new contract," Mourinho said. "He wants to stay and commit for many years." 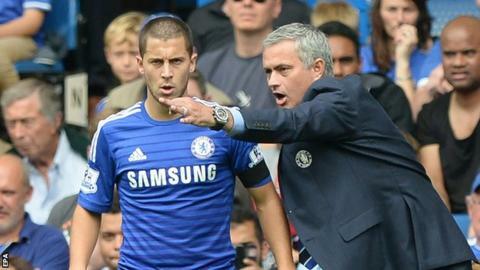 The Portuguese described Hazard as a "fantastic" player who is keen to develop - potentially into one of the "greats". "We think he can and we are very proud that he thinks Chelsea is the perfect environment for him to have that evolution," Mourinho said. "We have big hopes that he will go from a top player to reach higher levels." He was criticised by Mourinho for a lack of defensive awareness after Chelsea were knocked out of last season's Champions League by Atletico Madrid. However, speaking ahead of Wednesday's Champions's League Group G match against Schalke at Stamford Bridge, Mourinho said Hazard had since worked hard to develop his game.